Bamboo Charcoal Bags are an all-natural odor eliminator. Linen bags filled with activated charcoal will naturally absorb odors from your shoes, shoe closet, gym bag, car, and refrigerator, drawer, sporting equipment, closet and pet litter box areas, without filling the environment with chemicals. It's an effective, environmentally friendly deodorizer and air purifier. Conventional air fresheners mask bad odors but bamboo charcoal adsorbs and removes odors. Thus you and your pet won't choke on chemical fumes. Bamboo Charcoal odor eliminator bags come in a convenient 50g size bag, allowing you to put them practically anywhere. Place them in your gym bag, shoes, and skates. Hang them on a hanger as a closet deodorizer, or use them as a drawer freshener. Please note it may be necessary to use double bags or triple bags in a larger area. This natural air purifier bag is made of premium material, specially sourced bamboo charcoal which has undergone a special high heating process that makes it extremely effective. Placing activated carbon bamboo charcoal in the sun for about one or two once a month. It will be more effective and can be used again. ELIMINATES ODOR - 100% natural bamboo charcoal + linen bag, absorbs bad odors naturally and can be used in anywhere you need deodorizing. MORE QUANTITY - Our Bamboo Charcoal Bags (12-pack) double the quantity with the same price. The more bamboo charcoal, the sooner and better effect. GREEN ECO-FRIENDLY CHOICE - Pets and Children friendly; Fragrance free, chemical free and non toxic; No pumps, sprays, powders, perfumes or residue! 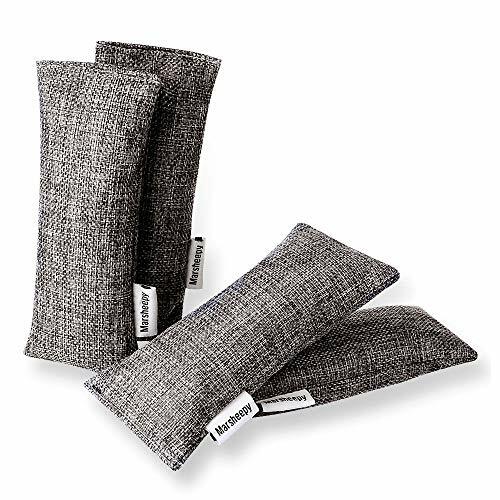 CONVENIENT SIZE - A pair of bamboo charcoal odor eliminator bags come in a convenient 100g size bag. Fits perfectly any small areas. SATISFACTION GUARANTEED - If you are not completely satisfied with your purchase for any reason, just let us know and we will fix it alright. If you have any questions about this product by Marsheepy, contact us by completing and submitting the form below. If you are looking for a specif part number, please include it with your message.